The costs of providing benefits is rising, fueled predominantly by the increase in health insurance and retirement costs associated largely with an aging workforce. This can be seen most starkly in the United States, where, according to the Bureau of Labor Statistics, benefits accounted for 32% of total employer compensation costs. 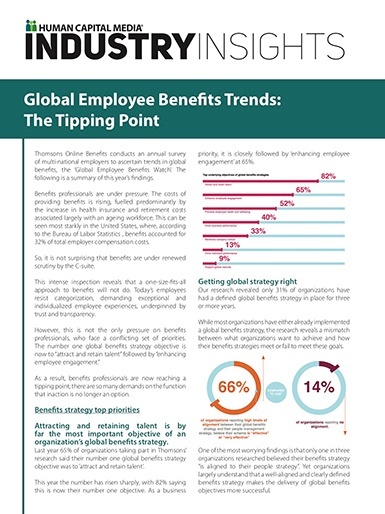 Thomsons Online Benefits is a SaaS provider of global employee benefits and employee engagement software. It is a wholly owned subsidiary of Mercer, a global consulting leader in advancing health, wealth and career. Mercer is a wholly owned subsidiary of Marsh & McLennan Companies (NYSE: MMC). Thomsons’ award-winning platform, Darwin™, is the global market leader for automated employee benefits administration. With over 2 million worldwide users, Darwin™ connects employees with their benefits in over 90 countries and 30 languages.